Years ago, when I first heard of grilled pizzas, I remember telling Matt we really needed to do this. This was perfect for us. Of course, we never actually got around to doing it. Perhaps a deep-seeded dislike of Bobby Flay prevented us from putting pizza on the grill, or perhaps it's simply because we just don't use the grill as often as we want to, despite moving it from the wild of the backyard to the side porch. So when I got a copy of Craig W. Priebe and Dianne Jacob's Grilled Pizzas & Piadianas, I was was hopeful. A book dedicated to grilling pizzas! And as the book was published by DK, I had a feeling it would be good. I wasn't wrong. The book is small yet packed with instructions, tips, recipes and pictures. I like a cookbook with photos, I admit, and this one didn't disappoint. The book begins with careful and elaborate instructions on everything from using the book to grilling, a chapter devoted to the tools needed for successful pizza grilling (you can do it both indoors & out), the basic dough and the various sauces and oils used in the recipes. There's a couple chapters for the grilled pizzas, one for the piadinas, another for salads, and even a section for dessert! We made three of the pizzas recipes over the space of about a week. They were all amazing, hearty, deeply-filling & attractive. We also made one of the salads, serving it in a pizza crust bread bowl! While I really enjoyed all the recipes, and have fairly littered the book with sticky tabs marking others we want to try, I will say this: it's not a book you'll turn to for a quick, week-night dinner. The dough, which is quite good, requires several hours proofing, then at least another hour chilling in the refrigerator. And practically every recipe is made up of 'steps'; steps you really need to be aware of before attempting! There are sauces, and oils, and marinating ingredients. All things that take time. But when you have the time, each step is worth the effort. It's the kind of thing you make when you have the entire day free. Or, as I mentioned to Matt after one massive cooking spree, it's the kind of thing you'd serve if you were having a group of friends over...everyone has a task, some making sauces or prepping ingredients, someone else in charge of the dough, and finally, the host manning the grill. What I suppose I'm trying to say is this: it's a darn good book. It's filled with really wonderful ideas and recipes for grilled pizzas and pizza-like sandwiches. Lots of flavor and color, on a pizza, with the advantage of that lovely wood-smoke smell (a favorite of mine). But despite the base dish...pizza...it's not a casual cookbook. With exception of the salads, served in regular old bowls, very little in this book comes together quickly. However, if you have the time and ingredients, the recipes in Grilled Pizzas & Piadinas are worth it. The Buffalo Wing---spicy chicken with blue cheese & celery; grilled pizza crust is brushed with an herbed olive oil, dusted with grated Parmesan, the sprinkled with shredded mozzarella and cheddar; this is topped with spoonfuls of a very nice tomato-basil sauce and followed with sauted red onion, celery and red pepper; last, chicken strips which have been cooked and tossed with hot sauce are added, as well as crumbled blue cheese. Grill as instructed, sprinkle with thinly slices celery. The Chicagoan---grilled pizza is brushed with herbed olive oil and sprinkled with grated Parmesan, sprinkle with shredded mozzarella and cheddar, top with tomato-basil sauce, roasted potato rounds, red onion, and grilled steak, grill as instructed, top with sour cream before serving. 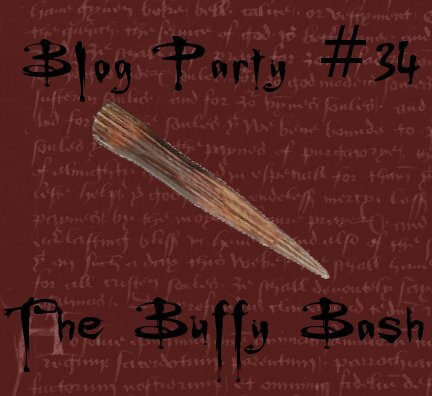 This month, Blog Party is having a Buffy Bash! The whole party devoted to everyone's favorite Slayer, with appetizers and drinks based on, or taken from, the show. So put on some season 3 DVD's and get those entries in before Thursday, the 15th. Hope to see you there! grilled pizzas have always been on my "to do" list too! Kind of pathetic, since we make homemade pizza dough pretty often, and have a BBQ... but I never think of it at the right moment! Hope to make ice creams tomorrow (another "to-do" item...). Glad the pizzas are coming out well, even if there is lots of preliminary proofing involved! sadly, I don't have a BBQ, but the book sound great and your pictures are divine! I love, love, love piadine! All those pictures have me starving (but, since it is after midnight I'll "try" to behave! My mouth is watering! I love pizza, I love the grill... it's a match made in heaven! I've never done the grilled pizza thing, but this looks really great! Katherine: I know, I never did figure out why exactly we never got around to it, either. I haven't dusted off (literally, you've seen my house!) my ice cream maker yet, but it's also on my to-do list. There's an amazingly long batch of recipes I've been wanting to try, but I'm fairly certain I never even used the machine last year! Must make up for that. pavotrouge: take heart! The book also gives instructions for cooking on a grill pan, or stove top, as well. It's a really lovely book. Phemom; somehow didn't get around to the piadiana section, but I definitely want to try them. Hee...kind of like grocery shopping while hungry, eh? recipegirl: as I mentioned, none of these were 'hard' to make, just a bit time-consuming. But absolutely worth it.